180gm white vinyl! Neyw pressing created from the original vinyl master tapes (no remix!). Wrapped in the original iconic fold-out black and white poster sleeve. Includes a code for a free digital download in the format of your choice. The Feeding of the 5000 is the first album by Crass, released in 1978. The record came to be made when Pete Stennett, owner of Small Wonder Records, heard a demo that the band had recorded. Impressed by all of the material, he decided that rather than release a conventional single by the band, he would put all of their set onto an 18 track 12 inch EP. However problems were encountered when workers at the Irish pressing plant contracted to manufacture the disc refused to handle it due to the allegedly blasphemous content of the track "Reality Asylum" (referred to as "Asylum" on the record sleeve). The record was eventually released with this track removed and replaced by two minutes of silence, retitled "The Sound Of Free Speech". This incident also prompted Crass to set up their own record label in order to retain full editorial control as well as political and legal responsibility for their material, and "Reality Asylum" was shortly afterwards issued in a re-recorded and extended form as a 7 inch single. 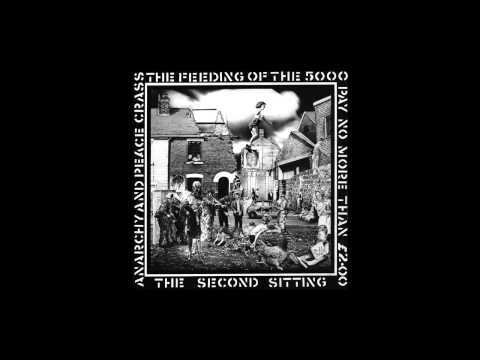 A later repress of The Feeding Of The 5000 (subtitled The Second Sitting) released on Crass records in 1981 restored the missing track. The song "They&apos;ve Got A Bomb" also features a period of silence within it, inspired by John Cage&apos;s "4&apos;33"". The band have acknowledged the influence of Cage, and said that the idea of the space in the song, when performed live, was to suddenly stop the energy, dancing and noise and allow the audience to momentarily &apos;confront themselves&apos; and consider the reality of nuclear war. According to band founder and drummer Penny Rimbaud, who wrote in 1986: "We named the album The Feeding Of The Five Thousand because 5000 was the minimum number that we could get pressed and some 4900 more than we thought we&apos;d sell. Feeding is now only a few hundred short of going golden, though I don&apos;t suppose we&apos;ll hear too much about that in the music press".